The period 1924 through 1934 would start as a dream for Armstrong, and end as a nightmare. Time that should have been spent developing his germ of an idea for staticless radio reception (FM) would be mostly squandered away in meetings with lawyers and fighting battles in court. To go back a little bit, Armstrong was hastened back from France to the U.S. when de Forest, seeking to gain priority on the regenerative (feed-back) discovery over Armstrong, filed suit in the Federal District Court for New York. This case would be decided, on May 17, 1921, in Armstrong's favor. De Forest would appeal this decision, but again, on March 13, 1922, the court would find in favor of Armstrong. The matter could have been settled there, but for a tactical error on Armstrong's part. The court assessed costs on de Forest, costs that a nearly bankrupt man and his small company (De Forest Radio Telephone and Telegraph Company) could not pay. Armstrong, during years of litigation, had developed a deep dislike for de Forest, and saw him as a man without ethics or technical merit, and would not waive the costs, he wanted complete victory. The case would not close. De Forest's only way out would be to appeal to the Federal Courts. Incredibly, after more hearings, the Circuit Court for the District of Columbia ruled, on May 8, 1924, that de Forest had proven priority of invention on the regenerative circuit and a patent was issued. De Forest, now backed by AT&T (and therefore RCA), who had purchased the patent rights, filed suit in Philadelphia to have Armstrong's regenerative patent held invalid. The court found in de Forest's favor in early 1926. True, the patent was 13 years old by this time, and the rights had been sold to Westinghouse, but this was a deeply personal battle for Armstrong and he was not going to give up. Armstrong took his appeal to the Supreme Court, but it was denied in 1928. That should have been the end of the battle. Small radio manufacturers in this country did not usually have access to the patent pools of the big corporations, but they manufactured and sold their equipment anyway. Such was the case with a small New York radio manufacturer by the name of Radio Engineering Labs (REL). In 1931 RCA filed suit against REL for infringement of the de Forest regenerative patent (one of about 4000 in the huge RCA patent pool). Having friends at REL, Armstrong soon became aware of the suit. This would be his chance to settle the score with de Forest. Armstrong quickly entered into an option to buy 51 percent of the company and back them in their fight against RCA. The first court to hear the case ruled in favor of RCA. Armstrong appealed, and the Circuit Court of Appeals found in favor of REL (Armstrong). This would not be the end. RCA appealed to the Supreme Court which, on October 8, 1934, reversed the Appeals Court ruling and ended the twenty-one year battle in de Forest's favor. It is fascinating that through 21 years of court battles, 13 court decisions and 30 judges, there was never any doubt, by the scientific community at least, about who invented regeneration. It seems Armstrong lost the battles, even the final and biggest one, but won the war. Armstrong somehow found time to develop his ideas during the late twenties and early thirties. He had spent a great deal of time studying natural and manmade static, and had become an expert. His goal was to devise a receiver that would do what no-one else had ever been able to do, eliminate static. He soon discovered that static was almost always amplitude modulated (AM), the same type modulation used to carry the intelligence of all broadcasting. Eliminating AM static by any scheme would destroy or distort the signal. Engineers had been working with frequency modulated (FM) signals for a number of years, but always narrow bandwidth FM, and they found it very unsatisfactory for carrying any type of intelligence. In fact FM had been shown, mathematically, to be useless. Armstrong worked with narrow band FM for sometime before giving it up, like so many had before. But instead of giving up on FM entirely, Armstrong started on a new path. 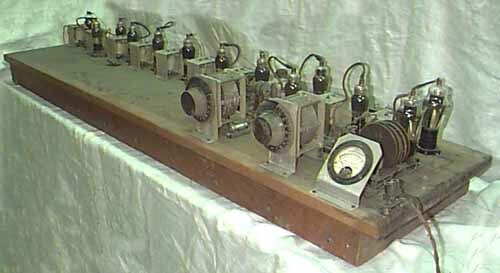 Between 1928 and 1933 Armstrong developed and applied for the four basic patents on what would be his fourth great invention, wide band FM. In accordance with his agreement to give RCA first right of refusal on future inventions, Armstrong demonstrated his wide band FM system, at Columbia University, to Sarnoff and RCA engineers in late 1933 and early 1934. The quality was very good, but actual field testing would be necessary to convince the more skeptical engineers, and Sarnoff, that the system could work. In 1931, NBC, the broadcasting arm of RCA, had installed a television transmitter on the 85th floor of the Empire State Building to conduct experiments with that new medium. By early January of 1934, RCA, not yet ready to start television testing, had placed the transmitter at Armstrong's disposal to conduct large scale field tests of his FM system. 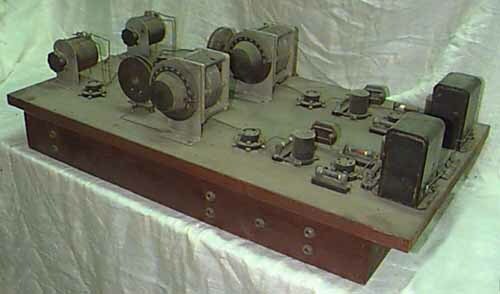 Armstrong's FM exciter equipment set-up in the Empire State Building in early 1934. 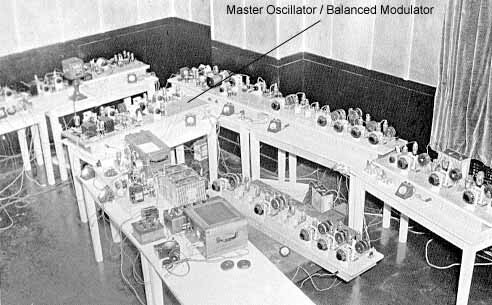 The master oscillator / balanced modulator unit shown in the above photograph, as it appears today. 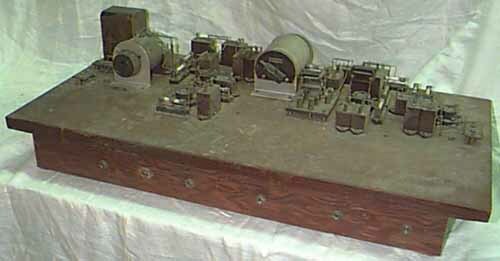 This may have been the first FM breadboard unit built, since all later RF stages are fed from it. Additional Columbia University / Empire State FM breadboards. The final breadboard stage before the transmitter.